Who Was Professor David J.C. MacKay? Sir David John Cameron MacKay, as he was permitted to call himself, was a British philosopher, physicist, and mathematician whose last professional position was that of a professor in engineering at the University of Cambridge. From 2009 to 2014 MacKay was the leading scientific consultant for the British Ministry for Energy and Climate Change. He wrote a book titled Sustainable Energy – Without the Hot Air which came out in 2009 . The book caused a furor over the topics of energy consumption and sustainable energy production without the use of fossil fuels. The book is licensed under the GPL and is available as a PDF file in a number of languages . MacKay used UK£10,000 of his own money to finance the publication of this book. He also worked on machine learning and information theory. In combination with these efforts, he developed Dasher as a completely new approach to writing without a keyboard. In 2015, MacKay was diagnosed with cancer. He recorded his illness and the process of dying in his blog . MacKay died a few days after his last blog entry in April 2016 at the age of 48. The influential software developer and author Pieter Hintjens, who is likewise ill with malignant cancer is following MacKay's lead and writing publicly about his experiences with dying in his blog  and for Hacker News . Dasher is a graphical text input system that makes it possible to use a pointing device to enter text efficiently with uninterrupted gestures instead of relying on a keyboard or a dictation program. Dasher can be operated with an onscreen keyboard, a mouse, or by way of alternatives, such as a mouth mouse or eye control. With a touchscreen, the program is controlled with a finger or pen. Additionally, Dasher can now handle language output, even if the language is different from the preset PC language (Figure 1). A brain-computer interface  is planned for the next version of the system. 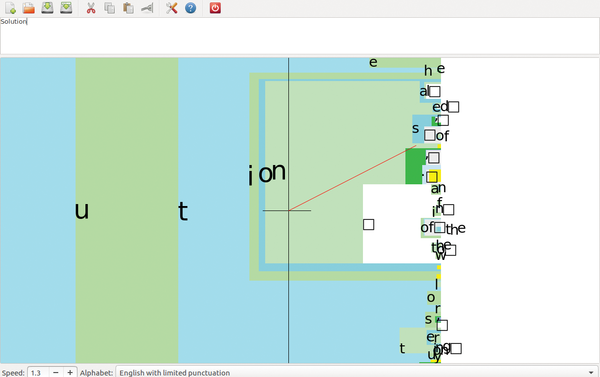 Figure 1: Dasher is available in almost every world language. The software is built into all large distributions. The 5.0 beta version  released in March 2016 is the most current, but it has not yet appeared in the distributions. Even so, you can compile this version from the source code . In addition to Linux, Dasher is offered with FreeBSD, NetBSD, Solaris, Android, and Windows. The program can be installed under Linux via the package management for the distribution used. When starting Dasher for the first time, you might think you have accidentally installed the wrong software, because the program looks more like a game than a text input system. This first impression is actually not that far off the mark, because Dasher borrowed heavily from arcade games like Pong  for the design of its controls (Figure 2). Thus, learning Dasher can be a playful and entertaining, if somewhat time-consuming, experience. 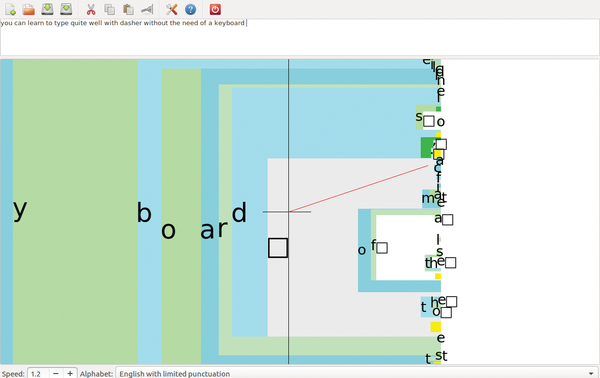 The developer promises that the reward for learning the system is faster and more accurate text input than is possible with an onscreen keyboard. This is especially true for eye control with an eye tracker. MacKay was personally convinced that a person who can move even a single muscle can also expect to have a device that makes it possible to control Dasher with that one muscle. On the strength of his conviction, MacKay built a device that uses breath as a control. 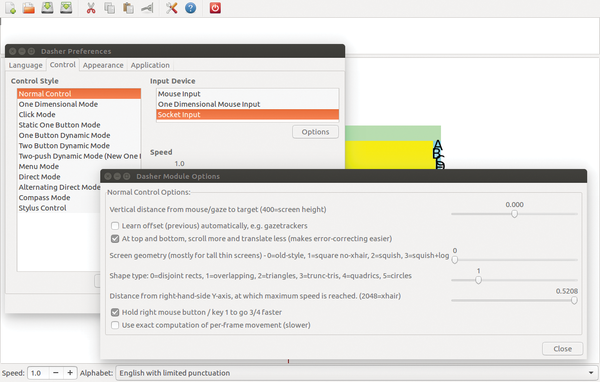 Figure 2: The Preferences dialog offers various modes. In the background, Dasher runs a probabilistic predictive model to give priority to probable characters and character combinations. The most probable combinations of the letters of the alphabet are displayed more prominently so that these are more easily accessible (Figure 3). Writing works fluidly: Starting and ending a writing session requires just one click of the mouse. This is different from an onscreen keyboard, which requires a click for each character. The program also handles speech output by attaching itself to the PC's Text-to-Speech system. Dasher works in almost all languages and alphabets. Recently, the Japanese and Chinese alphabets became available. Figure 3: It takes a little practice to get the first word out. In addition to the hardware environment, the use of Dasher requires a certain level of intact vision and reaction capabilities. The speed of movement toward a character can be set as desired. Dasher can come across as somewhat complex even for fully abled users. However, learning certain motions goes quickly and are soon almost mechanical. Once you internalize the principle behind the various color surfaces and the characters they represent, it becomes possible to write 20 to 25 words per minute. The practice needed to work up to this speed usually lasts several hours (Figure 4). Experienced users of eye control can input 30 words per minute which is almost the same rate achieved with handwriting. Master mouse handlers can input 40 plus words per minute. Figure 4: After an hour, it is possible to write a sentence fluidly. 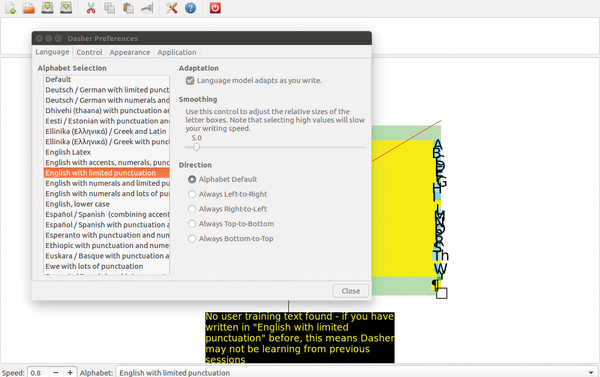 Dasher comes with English training text installed, but if you want to train your version in another language (Figure 5), many texts are available for download . Figure 5: You have many training texts from which to choose. Not every window manager provides a program for managing a clipboard. With Zenity and a script, you can comfortably control Xclip from anywhere.